Action Bowling Free is made by Kronos. It actually has you hold your device and swing it like a bowling ball in order to get the ball to go down the screen. This isn’t the best game for sitting around in a crowded area as you do have to swing your arm at least a little to get the ball going. Not to mention a few looks may be thrown your direction wondering what you’re doing with your Iphone or Ipod Touch while some fast-paced music is jamming out of it. You have to hold your thumb on the screen (the direction make sure to tell you to hold onto the device firmly!) and then swing it you would a bowling ball and then lift your thumb to have the ball go down the lane. Action Bowling Free iPhone game seemed to work fairly well in calculating a comparable speed for the ball depending on how hard I was swinging the Iphone or Ipod Touch. Within the settings you can set up whether you would like to have a straight throw, a hook, a curve, or some custom setting. Each of these presets adjusts two slider bars giving you options for the spin of the ball and for the speed. 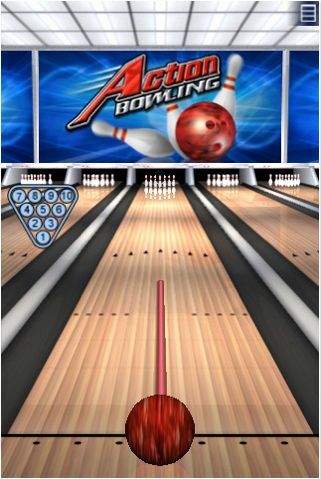 There is an option to flick your finger on the screen as well to bowl so you don’t necessarily have to act like you’re throwing the ball, but this game seems to have marketed the first play style to stand out a bit from many others. Curving or hooking the ball when just using your finger is a bit more difficult to actually hit the pins. Given that it’s a free game it seems well put together and definitely worth a look. Download this Great and free Action Bowling game for your iPhone or iPod Touch Here. How to use the iOS 5 Reminders app?